Published in the January 2013 NAWCC Bulletin, starting on page 77. My biggest challenge in repairing/restoring clocks is remedying previous repair folks fixes. More specifically, poorly soldered pieces are one of the most vexing mechanism problems that I run into – it seems that everyone loves to solder because it is such a permanent solution. And hey - if a little solder will do the trick, gads, won’t a little more work even better? More solder will always take care of a poor fit! This Tid-Bit focuses on the repair of a poorly “fixed” Vienna Regulator crutch, and putting a broken winding drum click back together. But, before getting into the how’s and why’s of this article, let’s first think a little about safety. I use a variety of small torches when soldering small pieces (see Figure 17 for two of them). Torches remind me of the rule I was taught when taking a gun safety course – don’t ever point a gun at something you don’t intend to shoot. Likewise, don’t ever point a torch at something you don’t want to torch. And, just like when shooting, it is very important to look around and behind the workpiece you are heating to see what you might be inadvertently about to torch. Often the first step in repairing someone else’s work is to remove the excess solder. There are times that the most effective way to remove solder is to heat the work piece, and then wipe it with a piece of cloth to remove the melted solder. Always wear a leather glove when wiping away excess solder with a piece of cloth to keep from getting burnt. I do most of my soldering on a fire brick. A fire brick is capable of withstanding fairly intense heat without cracking or melting. Granted, heating with an oxy-acetylene torch will melt a fire brick. But, using propane, butane or MAPP gas (trademarked name belonging to Linde Group for a fuel gas based on a stabilized mixture of methylacetylene (propyne) and propadiene) torches will not melt a fire brick. When you are done soldering a workpiece, especially when working on a fire brick, well, it only stands to reason that the workpiece is very hot. A fire brick retains heat and slows the cooling process. Especially when working on a fire brick, let the workpiece cool for a while – make sure the solder has set before picking it up, and use a pair of tweezers or a pair of pliers to pick up the piece. Flux is used to prevent oxidation of metals that are being soldered and to ease the flow of the solder on the metal and into cracks or crevices. Many fluxes are acidic. It is imperative that eye-protection be worn when soldering to prevent molten solder or acidic fluxes from splattering into the eyes. It is also important to look at what might be impacted by the acidic flux when you are putting it on a workpiece. One of the worst problems that I see is caused by a repair person soldering a broken part with the part still in the mechanism. The heated flux vaporizes, and then condenses on parts near the piece being soldered. In a couple of years the flux, if not properly rinsed off, will destroy the surrounding bits. When done soldering always rinse the workpiece in cool water for 30 seconds as soon as the workpiece has cooled to remove any residual soldering flux. What I hope is a fairly obvious corollary: Don’t solder pieces that are still attached to the mechanism. When soldering a complex piece, one which might retain flux in an inner cavity or such, it is a great idea to clean the workpiece after soldering in an ultrasound with an ammonia-based cleaner. Ammonia, being a base, will very effectively neutralize any residual acidic flux. It is a good idea, when heating solder, to think about where the molten solder might fall if it happens to drip. Sometimes I solder pieces held in a vise on the side of a work bench. There is nothing quite as exciting as having melted solder drop on your foot – or slip right through your socks or fabric shoes and come to rest on your bare skin. 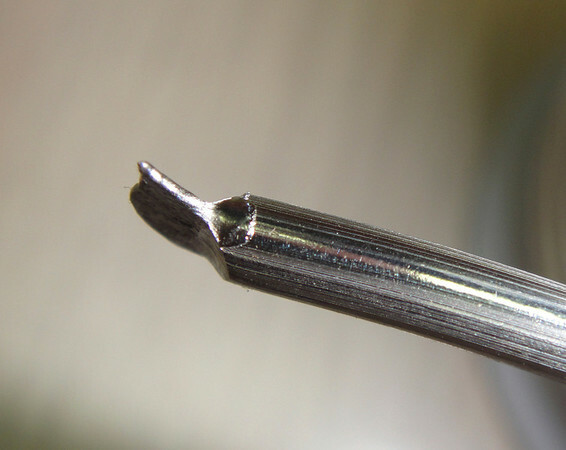 Lastly, an Exacto knife is very effective at removing excess solder – and skin. When I am using an Exacto I think about where the blade will go if it slips, and then do my best to not have anything in that area – just in case. I also remember the friend who was cutting veneer with an Exacto – fortunately they were able to remove the piece of it from his eye after the blade snapped in two. Wear safety glasses when using sharp knives. The crutch hub shown in Figure 1 is from a Vienna Regulator mechanism. It had been previously broken and soldered. Figure 3 – Silvabrite 100 solder compressed to make it easier to cut off a very small piece. It is important to not use more solder than is necessary - which it typically very very little. I find that the easiest way to cut very small pieces of solder is to first squeeze the end of a piece of solder so it forms a thin sheet. I then use a pair of small diagonal cutters to cut off small pieces.